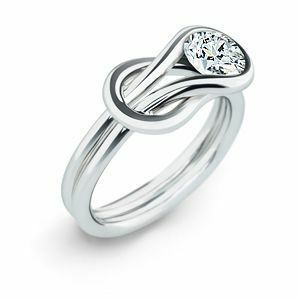 Everlon Diamond knot rings are modeled after the strongest of all knots, the Hercules knot showing the powerful vitality of your love. The Everlon knot ring is shown here in 14 karat white gold with a 1/2 carat white diamond at its center. The infinite loop design of Everlon jewelery can be yours from Kranichs Jewelers.